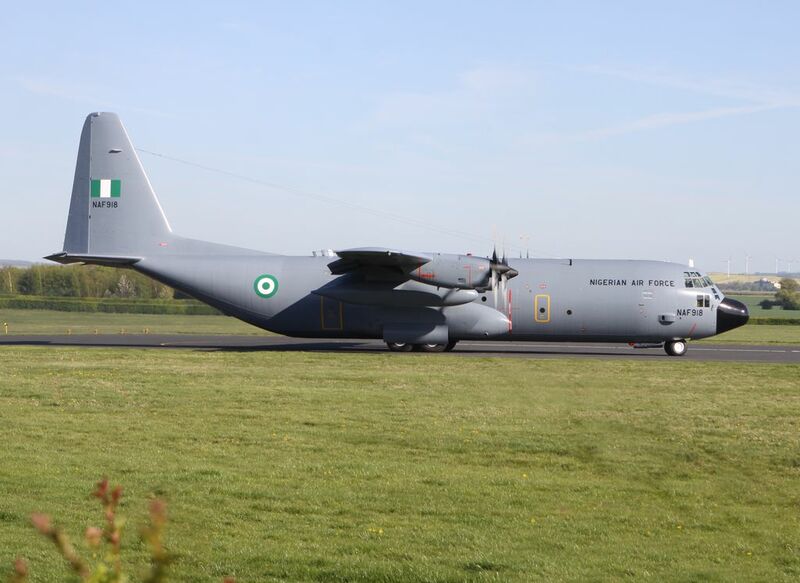 The Nigerian C-130H-30 that had arrived at Cambridge in August 2011, was eventually air tested. Here is its weird story. On Apr. 16, Nigerian Air Force C-130H-30, registration NAF918, conducted a test flight from Cambridge airport. The air test came slightly less than three years after the aircraft had arrived on Aug. 28, 2011, from Lagos, Nigeria, where it had been dumped, out of use, for a period of 7-10 years. When U.S. financed restoration program, the Hercules was flown to the UK for major overhaul with Marshalls Aerospace. But its ferry flight was a sort-of Odyssey as The Aviationist’s contributor Tony Lovelock, who took the photographs in this article, recalls. “Since the aircraft was unable to pressurise, due to massive corrosion of the front windscreen frames, it was flown low level at 12,000 feet from Lagos to England, by pilots wearing helmets and oxygen masks,” Lovelock says. The radio failed as the aircraft was inside the French airspace. Mirage 2000s were scrambled to intercept and shadow the 30-year old cargo across the Channel and hand it over to the RAF Typhoons of the 11 Sqn QRA (Quick Reaction Alert) from Coningsby, which eventually escorted it until landing at Cambridge airport. Upon arrival, the aircraft was met by dozens of Immigration Officers and Police, as someone had made a hoax telephone call, saying there were up to 50 Nigerians on board , who were trying to attempt an illegal entry into the UK. Following inspection by Marshalls inspectors, work sheets were prepared and work eventually proceeded to return this aircraft to an airworthy condition. Twenty months later, having exceeded its anticipated financial budget many times, during what eventually became almost a complete rebuild, NAF918 finally departed Marshall Air field, Cambridge, runway 23 for its first Air Test at 17:30 LT, returning at 19:30, on Apr. 16, 2014. The image below shows NAF918 as it prepares for the test flight on Apr. 16. The flight on Apr. 15 was cancelled due to an oil leak from number one engine, and electrical snags that had manifested on Tuesday but were fixed on Wednesday morning, just in time for the flight scheduled for later that day.